If you think of Nebraska as a flat, treeless prairie, a visit to the Arbor Lodge State Historical Park and Arboretum will change your mind. This site in Nebraska City is the home of Arbor Day, a national tree-planting holiday initiated by Nebraskan J. Sterling Morton in 1872. Arbor Day is observed on the last Friday of April. The lush 65-acre arboretum has more than 260 species of trees and shrubs. A 52-room mansion, built by Mr. Morton's eldest son, sits on the park's highest point and is now a museum (pictured above). Nebraska City is 50 miles south of Omaha, where U.S. Highway 75 meets State Highway 2. The grounds and arboretum are open year-round. 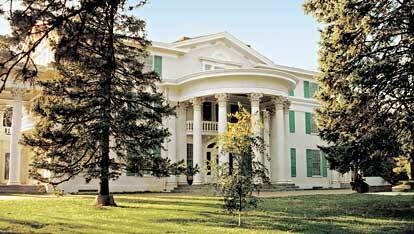 The mansion is open April through December; a nominal admission fee is charged.